Recent spells of arctic weather have left many of our natural areas seemingly bereft of birdlife. Except for a crow here and a red-tailed hawk there, it appeared that most birds in the Barrington area had either flown away or were hanging around bird feeders. 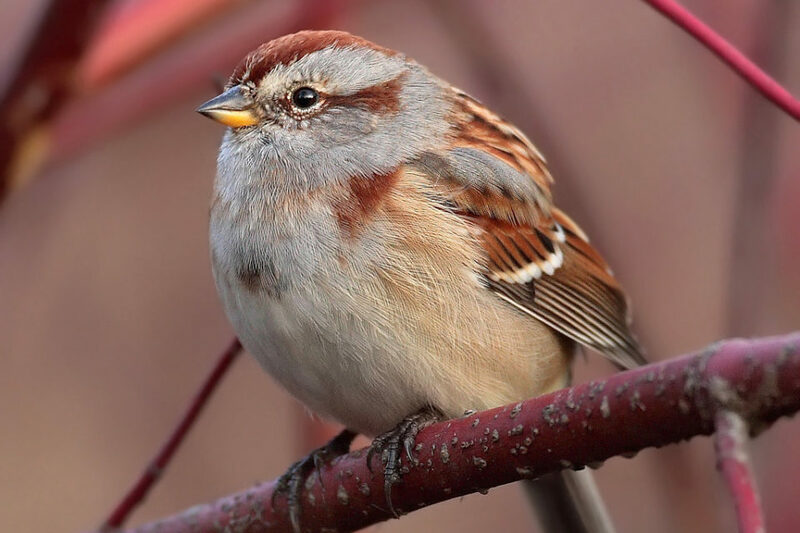 But there is one songbird species that I have consistently encountered, even on walks on sub-0º days: the American tree sparrow (Spizellloides arborea). The tree sparrow is a species we see only in winter in this locale. It is a bird of the far north and only shows up in the Barrington area when serious winter weather has moved in. It’s a species I’m always glad to see, as it inhabits the same landscapes that field, savannah, and song sparrows have vacated. While I frequently encounter tree sparrows in wide open fields and prairies, feasting on the seeds of Indian grass and other graminoids, I just as often will find them in thickets, especially in early morning, where they no doubt have roosted overnight. Unlike what its name suggests, the American tree sparrow is not much a bird of trees. It nests on or near the ground in the far north, mostly on tundra, and forages for food on the ground or on plants near the ground. Often, when I’ve just about given up on seeing any songbirds on a cold winter walk, I’ll encounter a small flock of tree sparrows that were feasting on grasses and forbs right in front of me, but blending in completely with the tawny landscape. They usually do not fly far away and almost always I am able to get good, long looks at them through binoculars. I recognize most local birds by their songs and calls. But I confess that the American tree sparrow’s vocalization eludes me. Partly it’s because the species rarely sings in our area, as it departs before breeding season has begun in earnest. And partly it’s because the call it emits in winter is an inconspicuous “tssseeet” that’s hard to pick up when you’re bundled in wool hat and hood. Henry David Thoreau wrote in his journal in 1856, “That feeble cheep of the tree sparrow, like the tinkling of an icicle…, is probably a call to their mates, by which they keep together.” There is a longer call that the tree sparrow makes which I’ve heard only on tape and I am making a point to listen for and learn it on walks in the weeks ahead. Deep winter is the time to see American tree sparrows. If you maintain feeders, you may well attract the species with millet and other seed. But more challenging – and rewarding, in my book – is to find them flocking and foraging in local areas such as Beese Park or in open fields in Lake and Cook Country forest preserves. Their bright, active, and often sudden appearance makes the effort to get outside on a cold winter day well worthwhile. Click here for image source at wikipedia.org.